"A LOVE SUPREME / UNIVERSAL TONE "
40 minutes interview & live session! VINYL LP Release in november 2017! Live Concert at Bauer Studios in Ludwigsburg featuring Nippy Noya on percussion! It is recorded live direct-to-2-track! Here is a report of the concert. • listet in the "25 best albums of the year"
KA MA QUARTET released their first tribute album on 09/02/2016. It features new interpretations of John Coltrane’s legendary suite A Love Supreme. The album also features a very special guest: legendary Indonesian percussionist Nippy Noya, one of the most renowned and sought-after conga players in Europe. NEW LIVE VIDEOS KAMA Quartet @ Fattoria Musica Studios ONLINE! 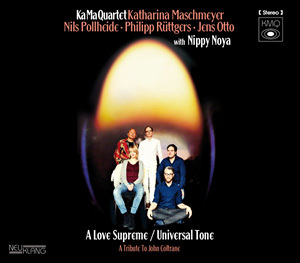 "Puts her own musical mark on John Coltrane's revered suite 'A Love Supreme', interpreted through the lens of her own, individual experiences and veering far off the original's sonic world: Katharina Maschmeyer." "The band leader, guitarist Nils Pollheide, keyboard player Philipp Rüttgers, drummer Jens Otto and guest percussionist Nippy Noya have rhythmized and spiced up the original quite a bit, adding some inspirational fire to it instead of watering it down." 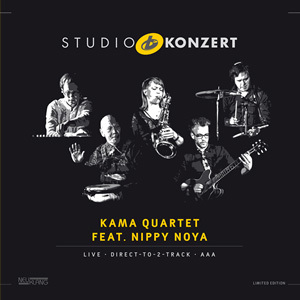 - BR (Bayerischer Rundfunk) "CD Tip in september"
The KA MA Quartet recorded a new album with Nippy Noya on percussion! 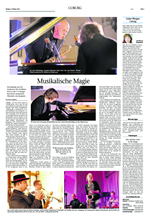 Press report about the "Coburger Jazznacht"
"The saxophonist with the powerful sound is lauded as one of the best new German jazz artists, and rightly so. 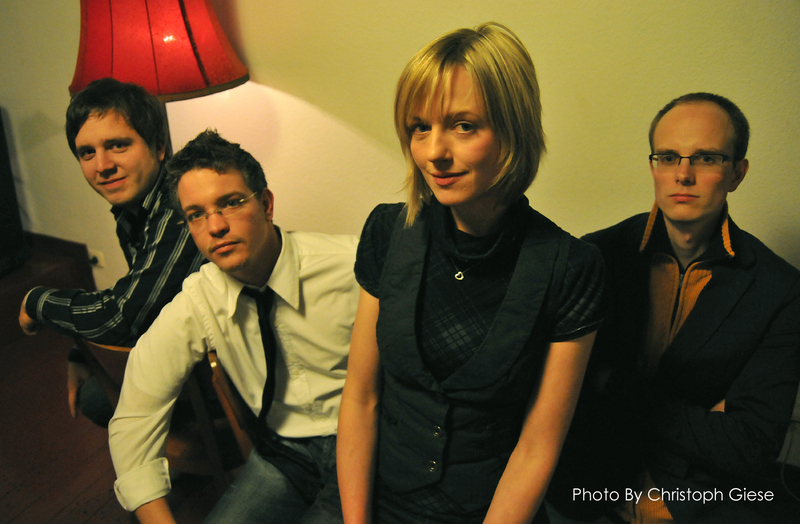 With “Duck On Ice, Flying Cow”, her quartet has definitely proven it’s a winner." 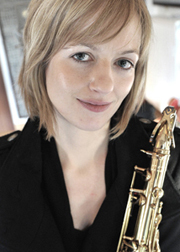 Katharina Maschmeyer (saxophone/composition) got her Master Degree in the Netherlands. 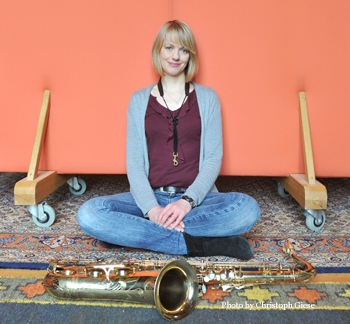 She graduated her Bachelor Study in Jazz- Saxophone at the “Conservatory of Arnhem” (Netherlands). 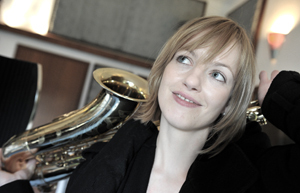 She studied with Jörg Kaufmann and Frans Vermeerssen and attended workshops by Dave Liebman, Vincent Herring, Steve Swallow, Carla Bley and Kurt Rosenwinkel. Further she absolved vocal lessons by Lis Harting, Hartog Eysman and Marielle Vester. In the course of her following Master Study in Zwolle (NL) she additively focused on composition. 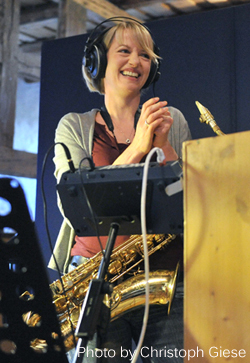 She had lessons (saxophone/bass clarinet/composition) from Rolf Delfos, Sjoerd Dijkhuizen, Allard Buwalda, Simon Rigter and Joan Reinders, furthermore additional vocal lessons from Adrienne West and workshops with Joe Lovano and Dave Douglas. 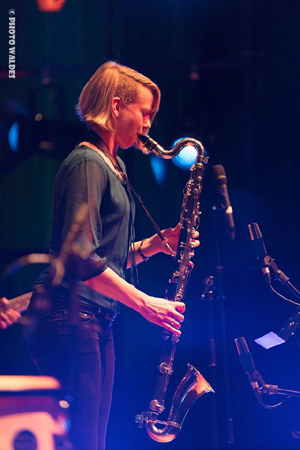 "The saxophone player Katharina Maschmeyer is one of the most hopeful talents of the german jazz scene. Her latest album confirms this." - Wendland Jazz e.V. The quartet play original music which is very multi-faceted and energetic and relates from jazz, funk to rock music. After establishing the quartet in 2005 many successful and reputable concerts in Jazzclubs like Club Voltaire in Frankfurt followed. 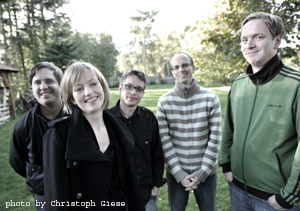 2010 the Debut Album which documents the first creative years of the quartet was released on the label Mons Records. The album received many good reviews and a feature in one of Germany's most well known jazz magazines „Jazz Thing“. 24.08.13; Ratzeburg, Jazz in Ratzeburg e.V. 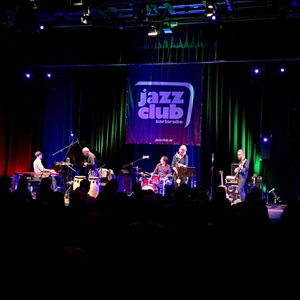 Archive: 12.01.12; Bitburg, Jazzclub 13.01.12; Bad Kreuznach, Jazzkeller ; feat. Frederik Köster (tp) 02.03.12; Hamm, Jazzclub; feat. Frederik Köster (tp) 17.04.12; Detmold, Kaiserkeller ; feat. Frederik Köster (tp) 03.08.12; Meppen, Blues und Jazznacht 26.09.12; Köln, Jazzkeller im Hahnheiser; feat. Frederik Köster (tp) 31.10.12; Arnheim (NL), Kunstruimte Bosch 07.11.12; Leverkusener Jazztage; (future sounds) 20.03.11; Aachen,Dumont 23.04.11; Hamburg, Jazzclub im Stellwerk; Gastsolist: Mark Harms (tp) 05.08.11; Meppen, Blues und Jazznacht 22.09.11; Gelsenkirchen, Consol Theater ; Gastsolist: Mark Harms (tp) 14.10.11; Cloppenburg, Bebop; Gastsolist: Frederik Köster (tp) 21.10.11; Dinslaken, Jazzinitiative; Gastsolist: Mark Harms (tp) 27.10.11; Osnabrück,Blue Note; Gastsolist: Frederik Köster (tp) 22.04.10; Osnabrück, Blue Note 06.08.10; Meppen, Blues und Jazznacht 22.10.10; Frankfurt Club Voltaire; feat. Frederik Köster (tp) 29.10.10; Kleve, Coffee House 01.12.10; Zwolle (NL), Jazzy Jam 17.02.09; Enschede (NL), MAC Berlijn, "Knud Krautwig Quartett" 28.04.09; Osnabrück, "Knud Krautwig Quartett" 07.08.09; Meppen, Blues und Jazz Nacht, "K. Maschmeyer Quartett" 31.10.09; Witten, Jazzclub, "K. Maschmeyer Quartett" 20.11.09; Viersen, Jazznacht, "K. Maschmeyer Quartett"